We are on a little trip this weekend so I don't really have a good post to share. So I'll just tell you about some stuff I'm doing or coming up. I have just finished some major dental work and I love it! I had some porcelain bridges put in (old ones broke, major yuck!) and they are so white and beautiful! They were so worth it! 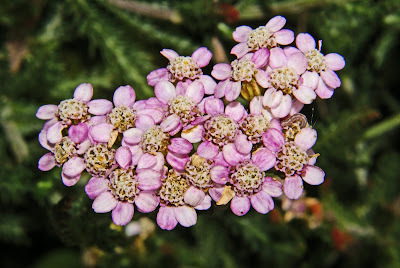 I've been trying out some samples of some natural body care products. I'm waiting to see how I like them so I can share my opinion on them. My gardens finally got some rain water (they've been getting foacet water) and everything is looking good. I still have some okra to plant and some herbs. And next week I'll have a couple of posts that I'm excited to share with you! I haven't totally finished the room but I've done the majority of stuff that I was wanting to do. Go here to see the before of the room. The biggest thing I didn't do was the headboard. I'm still going to do it but it will probably be a few months till I get to it. It's a big project and I've run out of steam. I'll try to get to it by fall because that wall is an outside wall and it gets cold in the winter. So, I'd like to have it done by then. Here's a pic of the bed side of the room. I got new lamps and added some new pillows and shams. I still want new nightstands but what I want is costly and unless someone is giving me some money for them, it will be a while before they are replaced. We also got rid of our alarm clocks, which I'm SO happy about! I've always hated them. Since David uses the alarm on his phone and I don't use one he agreed to get rid of them! Not much changed here except the little picture frames and the jewelry box I really like how the jewelry box turned out. The blue is just a little bit unexpected but it still goes with the room. I'd still like to replace the frame on the wall to a larger one but it's not bothering me that much so it stays for now. I added additional vinyl lettering to the existing Love. I made the 2 foreign words for Love and the little swooshes (not sure what to call them). And I painted the dresser and finally gave it some knobs. I love how this turned out! I also have plans to cover the TV wires but I just haven't got to it yet. So that's my after, or rather mostly after! I'm pleased with the changes and now I'm looking forward to moving onto other projects. I have a biggie planned for the living room! Well its been a successful sugar free Lent season. I did pretty good at removing sugar from my diet and at breaking the need to have something sweet after lunch and dinner. Honestly it was easier than I expected. I had been hurting so badly after eating sugar that I had an association between sugar/sweet and pain. So, while I had cravings it wasn't that bad. I cut all High Fructose Corn Syrup (HFCS) from my diet and any of it's siblings. And I tried to cut all regular sugar as well. I knew going into this what stuff I was eating that had sugar or HFCS so it was easier to cut out. But I did run into a few things that had HFCS that I never expected. For instance my bread had it, and we're talking whole wheat bread. Also Campbell's Tomato Soup. I was very surprised this contained HFCS! And disappointed. So I've decided to start making (or have David do it!) better alternatives. I love strawberry jam but all store brands have HFCS or are super expensive. So when strawberries get in season we're going to go berry picking and make some homemade jam with some organic sugar. 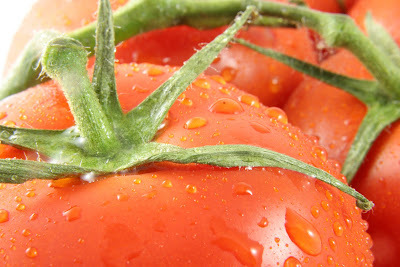 I'm also hoping to get enough tomatoes from my garden to use to make our own tomato soup for the winter. And I need to look at making our own bread (we have a bread machine so it's not hard) instead of buying it from the store. This time of cutting out about 95% of sugars (it's hidden) has shown me that I felt better, my skin even cleared a bit & I lost a few pounds, it's in EVERYTHING or at least anything that isn't grown, you have to really read the labels of your food. I'm really glad I did this. We'll be much more intentional about what we put into our bodies now. I also realize that if I'm not careful about when I allow sweets in my body that it can get out of control. I used to keep small candies (from Easter or Christmas that my mom gave us) in the freezer (out of sight usually) and would eat just one or two after lunch and maybe the same after dinner, every day. I claimed to myself that it was only a couple of pieces at a time and eventually I was very addicted. So we will be limiting our sweets to the weekend only, and using organic sugar when we need to use it. Yes I realize that it's April and I'm just now sharing my yearly goals. Partly because I made my goals after the year started and partly because I'm just now getting to it! I'm hoping to start doing more posts on natural stuff for a while. Start a compost pile - I did get one started. I just found a spot in our backyard to park it. I used some leftover bricks that we had to make just a very short wall around it. Right now that's working. And I think the pile is starting to work too. 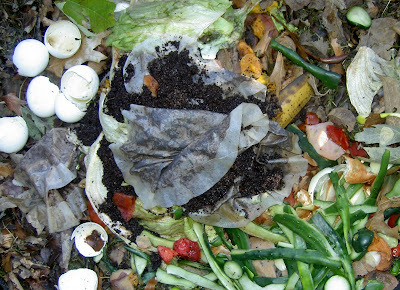 Start a vermicompost pile - I haven't done this yet. I think I might start this later in summer or fall. Change my face care - I have done this. I no longer "wash" my face with soap. I also don't use eye make-up remover, or face lotion. I use oil to clean my face and moisturize and remove eye make-up. One item does all that and does it well! I'll share more in another post. Change Trey's body wash - Trey has very sensitive skin (like me) and since he was a baby he's had eczema on his arms, face and legs. I finally realized that maybe his body wash and lotion (with all the chemicals) might be contributing to this. I did find a natural body wash. We haven't used it long enough yet to share about it. I also stopped washing his face with soap altogether and his face has cleared. I'll comment more on this in the future. Change my body care products - I also want to change my body wash, body lotion and deodorant to ones made with natural ingredients. Change cycle products - This is one I'm working on right now. I've started noticing how much trash I was accumulating during my cycle and I was hating buying new products every month or so. I had read about some tampon alternatives (more about that in a future post) and about "mama cloth". Mama cloth is reusable pads. Since I cloth diaper this isn't that far fetched an idea for me. If I don't want Trey to have that plastic chemical filled thing touching his privates, why would I want the same for me? I heard they are SO much more comfortable and that you don't even feel it. There are several places to buy them and also tutorials online to show how to make them if you want. I'll have to try out what I get and then I'll share more on this later. Start taking herbs - There are several herbs out there that are beneficial to women (especially during the childbearing year). So I want to start taking some of those to help get me ready for pregnancy, for during and for after and nursing. I'll share more on this when I get there too! There are many more things I'd like to do and to change but this is probably all I'll be able to do this year. I'd like to address my make-up, toothpaste, use more essential oils and buy more organic foods. This is a process of learning and slowly making changes. I'm excited about these changes and look forward to sharing what I find out! I'll be posting more on these as I use/do them and have had enough time to see how it works for us. I'd love to hear about changes you are making too! I'm Weird and You Can Be Too! 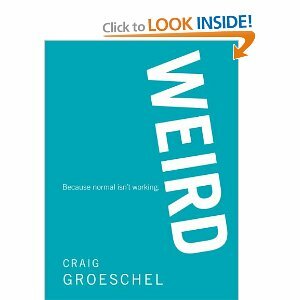 Right now our pastor, Craig Groeschel, at LifeChurch.tv is doing a series called "Weird". He also wrote a book on it called "Weird, Because normal isn't working". David and I are LOVING this series and we bought the book and love the book too. Basically you have to act/be like weird people to have a better life. Most people do what everyone else does, normal people, so they get the same results that normal people get. It's like peer pressure to fit in: live in debt and be broke, only have 2.5 kids, make sure your kids are involved in tons of classes/teams, birth in a hospital... The list could go on but the point is it's easy to do what every one else is doing cause they say you are weird if you aren't doing what they are doing. Now, I'm no stranger to weird. In fact I embrace it most of the time. I've never liked being like everyone else. In my family growing up, my dad was self-employed and so we had times of plenty and times of not so much. I have 3 sisters. These are a couple of things that made my family "weird" to those looking in. Over the last 4 years or so I've been getting weirder and weirder. After researching birth info I decided a hospital birth wasn't for me. I wanted to do a home birth. Now, when you go around saying you want to home birth you get a lot of looks that say "weirdo". But I didn't care, I wanted to be different and wanted better for my baby and me. I've been more and more interested in natural ways of doing things. Everyone buys their expensive toxic cleaning products, not everyone makes safe cheaper versions at home. And looking at ways to use safer health care and body care products. Recycling, gardening and composting. It makes me sad to see people who are so concerned with what "everyone" else says you should do or shouldn't do. The fact is most of the time everyone else just does what the next person does, without using their own brain to research or think about their choices. They think that since everyone else does it that it's safe to do (inductions, epidurals, living on credit, eating processed foods), when that isn't the case. They just go along with the crowd and letting others make their decisions. Like I said I embrace being weird because I've researched my decisions and thought about them a lot. I know the choices I make label me "weird", but I also know I'm doing what's best for me and my family. So here's a list of some ways that I'm "weird". I make my own laundry soap. I was home schooled for a couple of years (middle school). I don't wash my face (more on that in a future post). I'd love to hear what you guys have to say about any of this, or if you want to share some of your weird things too! I've had this jewelry box for a couple of years or so and I've never really liked the finish on it. I had been on the hunt for a new jewelry box and couldn't find one that I liked the form and finish on. So I settled on this one. I like the shape and how it's set up, and figured I can always change the look. I didn't really know how I was going to change it or into what until about a month ago. I'd seen someone spray paint their not so pretty jewelry box (which was similar to mine in shape). I loved it! And that's how it started! Since my bedroom has a lot of soft muted colors I wanted the color on the jewelry box to kind of pop. I wanted it to be a little unexpected. I was played it safe with the colors in the room and wanted to do something a little edgy. I know that painting a jewelry box isn't edgy but it had the potential to push my comfort zone with the color. Normally I would stick to neutral colors: white, black, tan, taupe.... But I wanted something different and after all if I didn't like it I could always repaint it! I found a bright (somewhat) blue in the fabric in one of the pillows. Then headed to Lowe's to find a blue that came close. I didn't take a swatch with me I just guessed. But I made sure it was a blue that I really liked. I then painted that sucker up! I liked it out in the garage but when I got it in the bedroom to it's little home I started loving it! It changed the feel of the room in a good way and was definitely the pop of color I wanted. After living with it for a couple of days I decided that I wanted to paint the knobs silver. I wasn't sure originally if I wanted to do that but I wanted a bit more dimension to it and LOVE the silver knobs. If you look on the left you'll see the shiny, wood with brass knobs. Shiny wood and brassy are just not me! You might notice that this isn't perfectly painted, once again I wasn't going for perfect. I struggle with perfectionism. The top has a piece of glass which allows you to see into the box. I didn't like that so I added a piece of vellum from my scrapbook stash and I love the way it looks! Here's a view of the top. I'm very excited with how it turned out! As most of you know, I've been trying to use more natural products. I've changed my cleaning products, some health products and I've been working on body care too. (I want to do hair and make-up as well but in the future) I recently bought a new body wash for Trey and I (we share). I'll share what it is some other time after I've used it a while longer. Anyway, I've been thinking that I need a good body moisturizer. Today I ran across this blog that sells homemade body butter as a way to fund their adoption. I don't know if I've mentioned here before that David and I have a heart for adoption. We really want to adopt in the future. We want several children and don't want to limit God's blessings on our life by telling him "only _ children". So we want to have them through birth and through adoption. We aren't sure when we'll adopt or how many children we'll add to our family this way. But God has laid this on our hearts. I'd love for you to go check out their adoption story, or buy one of their products which are available for a donation (just try to donate more than shipping and cost to make the product). You would be getting a product that is good for your body & helping a little one find a forever home! Before getting into this I want to show you a pic of David's side of the office. I haven't liked his side of the office since we moved into this house 4 1/2 years ago. It's always been a modge-podge of furniture and too much stuff for too little storage. It always looked cluttered even when it was clean, so it drove me crazy! Several months ago we had the dresser that I just painted for our bedroom in here, and that chest of drawers in the bedroom. It worked much better for both rooms this way, but the office still didn't work. Well after helping out "the K's" with some rearranging and downsizing in their office, they were kind enough to give us their desk. A solid wood L desk. this is the heavy side with some scratches that I worked on. He spent a good part of Saturday going through stuff and setting up his new desk. He still has a few piles left to go through but the majority of it is done. We moved the dresser into the office closet (we are fortunate enough to have a large walk in closet in the office, and it fit). The pile of books on the right will be up on a shelf soon (that's another project I'll show soon). The piles on the desk are still to be sorted. And yes we have 2 monitors for our computer, doesn't everyone?! We will probably rearrange some of the stuff on the walls but not yet. We have another Ansel Adams pic to re frame so that will require some moving. We found the one hanging and the one yet to be hung at Goodwill in UGLY frames for only a few dollars each. The one hanging I just bought a new frame for it and gave it to David as a birthday present. He LOVED it! He loves the mountains! We are also looking for a better way to handle the mail. Since David does the bills, the mail ends up on his desk in piles. Most of it ends up being junk, since we pay everything online. So, I'm working on a solution to keep the crap off the desk. I'll share more of that with you later, when I have something up and going. Less than a year after David and I got married we decided to upgrade to a 2 bedroom apartment from a 1 bedroom. My in-laws lived out of town and would come to stay a night with us and had to sleep in the living room on the floor. So we thought we'd get a bigger place. When we got married we were broke. So all of our stuff was hand-me-downs or stuff we already had. David had a set of dressers and nightstands from his grandparents. We only had room for the chest of drawers and the nightstands, until we got the 2 bedroom. I didn't care for the style of the furniture but I made the best of it by painting them. When I got the dresser I wanted to paint it red so I did! It stayed red for several years and through several moves until about 4 years ago when I wanted to paint it grey to go with my changing style. I painted it but never got knobs on it. It was such a paint to paint I lost interest, and I didn't really care for the shade of grey and just didn't finish it. It got put in the shed (along with my other extra furniture pieces) until a couple of years ago when we needed more storage in the office and decided to use it in there, as is. For a year or so, I've been wanting a larger dresser in our bedroom. One long and low. After window shopping for new ones that I loved and couldn't afford, I finally decided a few months ago to switch dressers with the office. It wasn't what I really wanted but when you don't have the money you get creative! So I sucked it up and decided to look past the mid-century design and make it work. I picked out the new paint color and knobs. And as of this week FINALLY painted it! Ok, here's the before of it after moving it to the bedroom. The 4 top drawers each have 4 holes for knobs. Not only do I not like that look (it's too busy looking) but it was going to cost a fortune just to get knobs for it. So, I filled all the holes. After seeing on tv someone use a small roller to paint a piece of furniture, it occurred to me that I needed to try it. I've painted LOTS of pieces of furniture but I'd always used either a brush or foam brush. And it always took forever. I thought rollers were just for the walls, it never occurred to me to use a small one on furniture! Duh! I also had been hearing about Behr's paint with primer at Home Depot. I usually sand the piece before painting it so the new paint will adhere better. And I SO didn't want to sand this time! The grey paint was oil based as well, so I thought I'd try the paint with primer this time. Ok, here's the finished piece. It's not moved into it's place yet, I'm still waiting on the paint to cure before I put the electonics back on it so it's sitting in the middle of the room. The piece on the right side behind it is painted the same color. I had it made (by Dad or David) to "cover" the DVD player and such. I want those ugly things to blend in as much as possible. I'll show a pic of it put together later. Anyway, after letting it dry David drilled new holes in the drawers. Only 2 per drawer this time. This dresser is really old and I by no means did a perfect job at filling holes or painting this dresser but I really love how it turned out. It's not supposed to be perfect, it just needs to be done. I can live with the imperfections in it. I have a few more things to take care of in our bedroom: a couple of small things and to make our headboard. I'm hoping to get started on the headboard this month but it probably won't be finished this month. So we'll see! I can't wait to show the finished result! I know that I haven't posted very many outfits lately. Mostly it's because I've been wearing everything I've taken pics of! I'm hoping for warmer weather more often so I show different outfits. Anyway here's the one outfit I photographed this week. It was kind of a rush outfit to head to the zoo, that's also why the pic looks funny. I'm linking up to The Pleated Poppie's What I Wore Wednesday. I'm going to be painting and cleaning today and I hope I can show the finished results by Friday. So we'll see! So this weekend we spent a LOT of time outside working on the outside of our home. I have to say I loved it, especially since the weather was beautiful! It started Friday night when hanging out with the K's we found out our city was giving away free trees, one per person! WOO-HOO!!! We just had to go pick them up! By the time we got there they didn't want to move what they had left, it was almost time to leave, so we got as many as we wanted. I got 2 for us and one for my mom. Saturday we had big plans: mow both yards, clean out & till up the flower bed, plant 2 trees, move a rose bush. We took care of all of that Saturday morning. Then decided to take Trey to the zoo after his nap. He's been asking to go for a couple of days so we went! Sunday after church, we sprayed the yard for bugs, and power washed the back porch. It feels really good to have gotten so many outside things done! The yards look good and I want to go out and enjoy them more now. Oh and the neighbors aren't embarassed by us now! The gardens are both planted now and I'm very excited about that! I planted tomatoes, peppers, onions, garlic and okra. I need to plant some herbs, and hopefully some carrots. I had some extra bricks so I sort of lined the courtyard garden plants with them. Just to help define where everything is and to help keep little feet out of certain areas. We're going to get a few large pavers to walk on. I love this time of year and look forward to tending my gardens, playing outside with my family and enjoying this mostly warm weather!